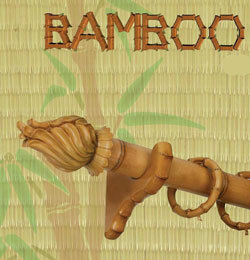 Bamboo curtain rods and poles with hardware accessories for creating back to nature window treatments. Choose from 1 3/8 inch to 2 inch to large 3 inch diameter bamboo curtain rods in a variety of finial shapes., You will also find brackets that look like bamboo that has grown into the shape of a bracket. 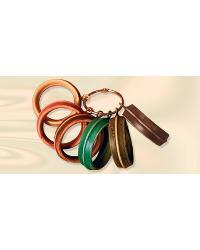 Hardware accessories include bamboo curtain rings with eyelets in sizes to accommodate these bamboo curtain rods. Adjustable swivel sockets that the bamboo rods fit into are perfect for any bay window or area where one might have an angled window or wall. Other coordinating bamboo curtain rod hardware offers paint colors that range from natural, to green and darker shades of bamboo. The Tropical decorative bamboo curtain rods and hardware accessories brings natural luxuriance into your home with this offering of tropical themed curtain rods. These tropical bamboo curtain rods are bursting with color and interesting fine detail for adding that natural appeal to your window treatments. It's bamboo hardware accessories consist of a variety of finials with bamboo looking brackets and bamboo curtain rings. Whether you are looking to decorate a tropical vacation home or just want to bring the tropics indoors, these decorative bamboo curtain rods will have you thinking beachside.